We arrived at Nehru Park (GOA SHG meeting venue) at around 9:15 am. After meeting each other with a traditional ‘HELLO’ we decided to seat face to face. As we were 3 members, so we sat in a triangular position (everybody was facing each other at a certain angle). We started the proceedings of the meeting. 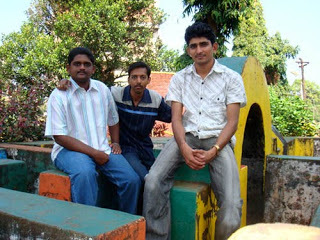 First Harish briefed us about his last week meeting with a director of one of his clients in his company. Then I shared my experiences of the tour at Murdeshwar (a Shiv Temple near Goa-Karnataka Border), last week, and Prakash told us about his stammering course and shared some techniques with us. While practising this exercise we stammered but it was intermediate. Oh… and I almost forgot! While Harish was briefing us about his last week’s meeting he also told us that he got a chance to meet his favourite politician “Mr. Manohar Parrikar” (leader of opposition, GOA) and also told us that he was able to communicate with him without showing any signs of stammering and was also able to get his visiting card. Harish considers this as one of his luckiest and happiest day in life (cheers buddy………many more to come). Then we just asked each others some questions on the respective topics. As suggested by Prakash we started giving with ‘introduction and question-answer’ in prolongation method (stretching a word slowly). First Prakash started to give his intro in front of us and we asked him a few questions related to his studies, college and business (let me tell u, this guy has abundant knowledge of mobile phones, networking and their softwares). Next Harish gave his intro and we both asked him some questions which he answered very well using prolongation and bouncing techniques and lastly I gave my intro and talked about my studies and future plans and answered the questions put before me by Harish and Prakash. Again we had a small chat on some topics related to our intro. We gave feedback to each other and discussed the benefits of prolongation technique. After the chat we decided to call Sachin Sir, but were unable to get to him. Harish then showed us the software ‘STUTTERING.PRO‘ on his laptop. We all tried slowly reading a comic book with the help of that software and later we did reading in sync, where we did not even stammer once. Now we decided to try our techniques and method in real world. So we left Nehru Park, and went to the North-East Crafts Exhibition, at Ravindra Bhavan, Margao. 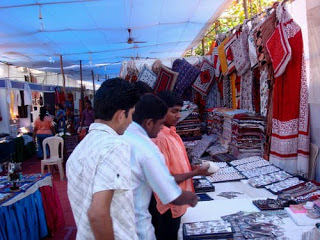 Here, were decided to walk through all the stalls, see the handicrafts, talk to the stall-keepers, ask prices, ask about the handicrafts. Basically, talk.. talk and talk. Now was our real test and guess what?????????……………….. 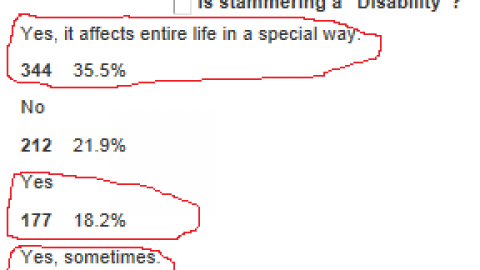 we were able to communicate with them with intermediate or mild stammering. At some point of time we were able to do the entire communication without any stammering. We asked the rates of different art pieces and were even able to bargain too without any stammering. We used certain helping words to start our sentences like “BOSS…….What’s the price?” or, “BHAIYA………….Iska rate kya hai?”. Finally we bought some beautiful handcrafted wall-hangings, pen-stands, paintings etc. and wound up for the day at around 12:30pm. 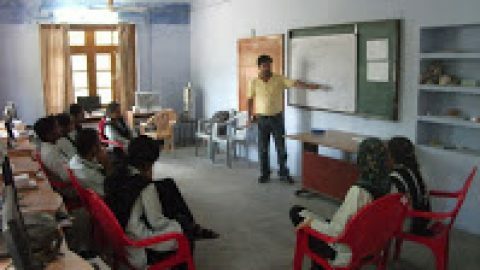 This SHG meet was an interesting one because we practised different techniques and applied it confidently outside our stammering life (while talking to non-stammerers). Tomorrow my college starts, with the new semester. I was nervous and tensed about the same. But after this meeting all that nervousness and tension was gone. We all were very happy and charged for the week to come. 2. 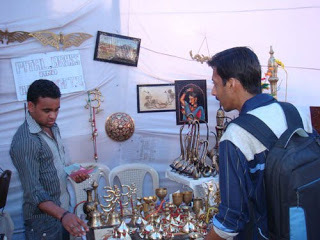 Prakash and Rahul talking to the stall-keepers at the crafts festival. स्वीकार करें, मज़बूत बनें . . . ! Rahul – u did a great job.. I wish I could be there!!!!!!! !